Blood ‘n’ Thunder last year ceased publication as a periodical, and I’ve been an abject failure at keeping this blog updated, but that doesn’t mean I’ve been sitting on my hands. Far from it! In addition to collaborating with Doug Ellis on the upcoming The Art of the Pulps (more about that in a future post), I’ve just finished putting together Pride of the Pulps, the first volume in an irregularly published series I’m calling Blood ‘n’ Thunder Presents. (More about that in a future post, too.) And I’m currently working on Volume Two of Blood ‘n’ Thunder’s Cliffhanger Classics—which, unlike the first, will feature a substantial amount of all-new content. 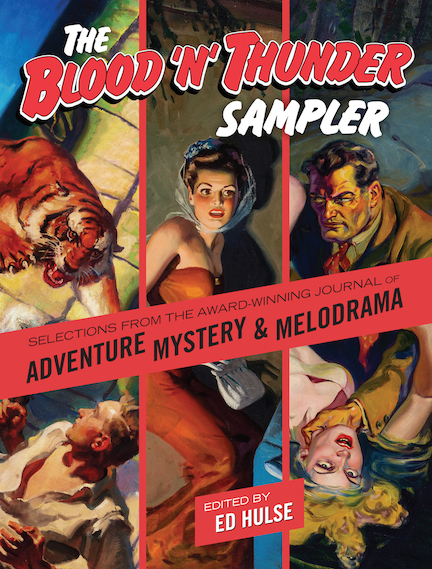 What brings me here today—just as I’m preparing to leave for the annual Windy City Pulp and Paper Convention—is the arrival of The Blood ‘n’ Thunder Sampler, now available for purchase and shipping. It’s a large-size trade paperback of 250 pages, reprinting 17 of the very best articles that appeared in issues 22/23 through 30. Long-time BnT readers and subscribers will remember that Murania Press has previously published two volumes titled The Best of Blood ‘n’ Thunder. Those books, which were published in a smaller format and used relatively few illustrations, have continued to be good sellers because they reprint material from the first 21 issues, now many years out of print. I wanted to try something different with the Sampler in hopes of attracting new readers to Blood ‘n’ Thunder. Being a profusely illustrated, large-format book with a two-column page design, it replicates BnT to a much greater degree than did the Best of volumes. With any luck, buyers will find it sufficiently appealing to justify purchases of back issues still available here on the site. Of course, the Sampler is a bargain in its own right: One would spend a hundred dollars buying the eight issues excerpted in its pages. Speaking as objectively as possible, the book offers a terrific cross-section of BnT material; I deliberately cast a wide net, making sure to represent not only pulp-related essays and articles, but also the zine’s other areas of interest, specifically vintage movies and Old Time Radio. Pulp-fiction content dominates, of course, and two of the movie articles (covering early Zorro and Tarzan films) have pulp connections. Compiling these writings for the Sampler also enabled me to improve some of them with additional information and correction of minor mistakes that slipped into print the first time around. And while most articles are illustrated as they were in the magazine, a few are accompanied by artwork not available to me when I initially published them. For example, my piece for #26 on the making of Gunga Din (which reworked an earlier essay I’d done for the Lone Pine in the Movies magazine) now includes several fantastic candids taken on the set during production. And a portfolio of illustration art by the legendary Norman Saunders sports repros of numerous pulp-cover paintings that have come up for auction since we first printed the gallery in 2009. I’m satisfied that the Sampler will make a great introduction to Blood ‘n’ Thunder and related publications. I daresay that even veteran BnT readers might find it useful, if only because it contains between two covers a lot of good reading you’d otherwise have to fish through eight different issues to find. You can get the Sampler right here.